They devoted their lives to educating and ministering to others, often in some of the most troubled urban areas of the country. Now the retired and infirmed Oblate Sisters of Providence are getting a state-of-the art retirement facility that will allow others to minister to them. In a joyful Oct. 5 ceremony, the nation’s first women’s religious order for African-Americans broke ground at their Arbutus motherhouse on a three-story building that will accommodate nearly 40 oblates with room to spare. The new $8 million facility will provide much more space than is currently available at their nearly half-century-old building on Gun Road, allowing the sisters to pursue a healthier lifestyle. The Oblates have a partnership with Johns Hopkins Bayview Medical Center in Baltimore’s Programs of All-inclusive Care for the Elderly. Once the building is completed, the sisters plan to renovate the existing facility to provide more space for a wide assortment of spiritual programs, retreats, workshops, educational programs, a daycare center and the Oblate archives. Since Mother Mary Lange, the order’s foundress, is under consideration for sainthood, Sister Annette added that more space is needed for the motherhouse’s Mother Mary Lange Center where increasing numbers of people who come to learn about Mother Lange. The sisters have launched a capital campaign and have already raised $500,000. 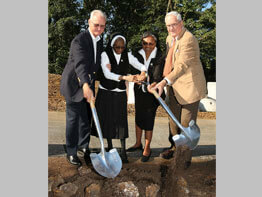 Sister Annette acknowledged that with the struggling economy, it’s a difficult time to undertake a major capital project. But a priest friend reminded her that another religious order in Baltimore successfully undertook major capital projects during the Great Depression.